A special debt-reduction committee in the US Congress failed to reach agreement, extending partisan gridlock into the 2012 election year and setting the stage for US$1.2 trillion in automatic spending cuts. Standard & Poor’s said it would keep the US government’s credit rating at AA+ after the super-committee’s announcement. S&P, which stripped the US of its top AAA grade on 5 August 2011, said it decided that the failure didn’t merit another downgrade. The International Monetary Fund (IMF) revamped its credit line program to encourage countries facing outside shocks to turn to the fund with few conditions attached, as European leaders fail to end their debt turmoil. The IMF said the new instrument, the Precautionary and Liquidity Line, can be tapped by countries with strong economies currently facing short-term liquidity needs. Funding available will be capped at a percentage of countries’ contributions to the fund, limiting the role the instrument can play in preventing the debt crisis from spreading in Europe. China widened efforts to support cash-strapped companies in Zhejiang and rural areas hit by a credit squeeze that’s slowing the second-largest economy just as Europe’s debt crisis saps export demand. The People’s Bank of China cut the reserve ratio for more than 20 rural credit cooperatives nationwide by half a percentage point where small businesses have complained about lack of access to credit. The Chinese central bank’s move reduces the percentage of deposits the cooperatives are required to park with the central bank to 16%, a “normalization” after an increase a year ago. Malaysian Government Securities (MGS) trade momentum was weaker last week compared to previous week. Profit-taking activities, especially along the shorter-dated tenures reversed previous week’s gain with yields rising across the curve. This was partly due to October Consumer Price Index (CPI) number being higher than expected as well as the weakening ringgit. On a week-onweek (WoW) basis, the 3- and 5-year benchmarks yields rose by 6 and 11 basis points (bps) respectively to 3.14% and 3.30%. Meanwhile, the 10-year benchmark yield climbed 3bps to close on Friday at 3.75%. On economic front, CPI increased by 3.4% year-on-year (YoY) in October 2011, the same pace as in September 2011 but was higher than consensus forecast of 3.3%. The increase in CPI was due to higher food and transportation costs. For Private Debt Securities (PDS) market, interests were seen skewed towards AAA-rated papers, led by debut of a banking-related bond and a power-related bond. This was followed by interest in AA-segment, which are mainly banking, toll and power sectors. impact to the local bond market as this may signal expectation of a moderating growth prospect for the last quarter of the year. Nevertheless, given the roll-out of certain committed investments under the Economic Transformation program, coupled with healthy domestic spending, Malaysia seems to be on track to achieve the projected 5-6% growth for 2011. There are two remaining government bond auctions for the rest of the year. We expect the last two auctions to be well received. Meanwhile, investors are waiting for the new auction calendar for 2012 to better gauge demand supply dynamics of the government bond segment for next year. We expect corporate bond market to be well supported for the rest of the year and investors may continue to extend duration on tame inflation and stable interest rate outlook. We remain positive on local bond market in general with focus on value enhancing corporate bonds. We look to participate in new issuances for further diversification and yield enhancement. Malaysia equity market performed poorly as concerns over Europe’s debt crisis continued to weigh down the market confident. Although most of the corporate results were in line with market expectation but analysts started to downgrade earning due to the gloomy outlook. For the week, the FBM KLCI fell 23points or 1.6% to close at 1,454 points. The FBM KLCI outperformed the region for the 4th week as up to Thursday the index was down 1.6% against the steeper 3.5% fall by the MSCI FExJ. Average daily trading value for the week fell 24% to RM1.14 billion (RM1.5 billion previously), which was 27% below the three-month average of RM1.57 billion. 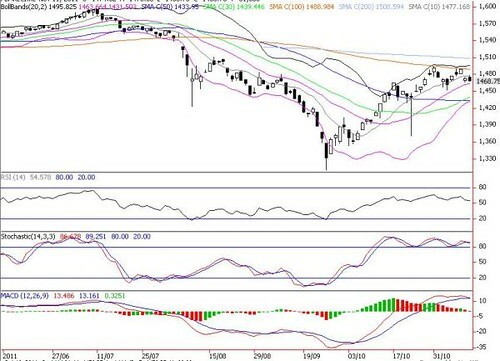 The bears continued to dominate the local bourses, causing the FBM KLCI to fall for its fourth consecutive week. 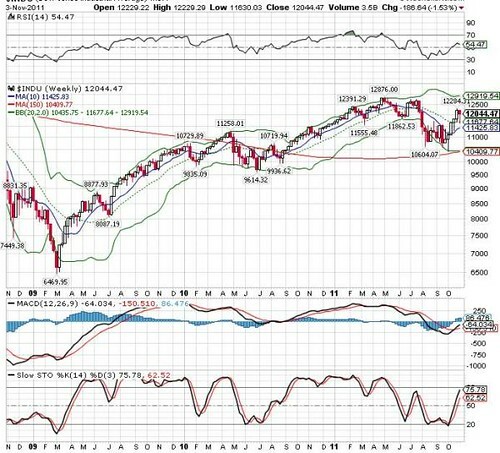 However the market was extremely oversold and tends to have a technical rebound before the next leg kicks in. Market will remain choppy and continue to be influenced by external factors. We see immediate support at 1,400 psychological level. Stock picking is still our strategy with preference for liquid fundamental stocks on weakness. The Dow Jones gained for a 2nd consecutive session amid robust November consumer confidence and optimism of further progress on a solution to Europe's fiscal mess. In Brussels, Europe’s finance ministers held an initial discussion on channeling ECB loans to cash-strapped euro nations through the IMF, aiming to insulate Spain and Italy from the debt crisis. However, Dow Jones’ gains were reduced to 32 points from as much as 101 points intraday on profit taking following the 2.6% surge on 28 November. Sentiment was also dampened by Fitch’s downgrade its outlook on U.S. credit rating to negative, possible downgrades of France’s AAA rating outlook (by S&P) the subordinated debt of Europe 87 banks (by Moody) across 15 countries. The Dow Jones leapt 291 points or 2.6% to 11523, erasing more than half of last week's 4.8% steep losses. Sentiment was lifted following robust retail sales over the Thanksgiving weekend providing a strong start to the holiday shopping season and hopes that European leaders will boost efforts to end the debt crisis. Euro-area finance ministers meet in Brussels today as governments bid to regain the confidence of financial markets, as Germany and France were exploring radical actions of securing deeper and more rapid fiscal integration among euro zone countries, before a European Union summit on 9 December. of it having talks with Italy about a bailout package worth up to €600 billion. Ahead of the extended Awal Muharram weekend break on 28 November, KLCI dropped 16.4 points to 1431.6 on November 25. Wow, the KLCI corrected nearly 23 points for a 4th consecutive weekly losses amid persistent worries over euro crisis, the sluggish US 3rd GDP of 2%, weakening China factory output coupled with disappointing German bond auction. Despite the overnight jump on Wall Street, we remain cautious on our market and still advocate investors to capitalize any rebounds to trim their positions or maintain a short-term trading oriented approach, given the external headwinds. We expect central banks and governments to intervene even more aggressively as credit market conditions deteriorate, and hence, volatility is likely to remain extraordinarily high. Unless the KLCI is able to reclaim the 50% FR barrier (i.e. 1453), downside risks will remain with immediate supports at 1420 (38.2% FR) and 1400 points. 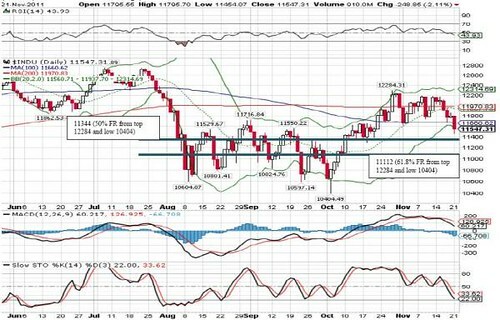 Further resistance levels are 1465 (mid Bollinger band) and 1478 (100-d SMA). The Dow Jnes fell as much as 113 points intraday to 11434 after 3Q GDP was revised lower to of 2% (earlier: 2.5%) and the cost of insuring French, Belgian and Spanish government debt against default leapt to records as bond yields in the region climbed. The losses were reduced to 54 points at 11494 amid signs that the Fed may provide more stimulus in the minutes of Nov. 1-2 FOMC meeting. Sentiment also improved following statement by Moody’s and Standard & Poor’s that there were no immediate plans to downgrade the credit rating following the failure to reach agreement on reducing the U.S. budget deficit. After briefly surpassing the 200-d SMA (now at 11967) to as high as 12284 (27 Oct), the Dow Jones plunged 6.4% to end at 11494 points yesterday. Momentum fizzled out as investors were pessimistic of the tricky Euro debts crisis management and an uncompromised plan on the US$1.2trn debt-reduction cuts, overshadowing the gradual progresses in the recent US economic numbers. Following the break below major supports of mid Bollinger band (11927) and 100-d SMA (11650), the Dow Jones may retest lower supports at 11344 (50% FR) and 11122 (61.8%). As slow stochastic readings are gradually turning oversold, the Dow may be able to defend our envisaged 11122-11344 supports. 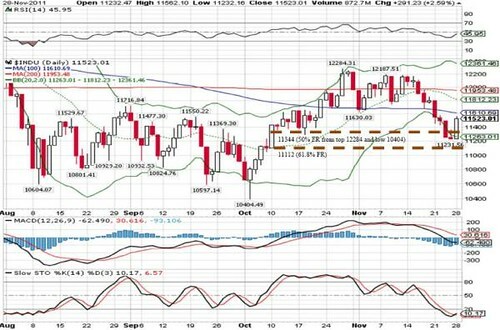 More solid supports are seen at 11000 and 10847 points. Immediate resistance levels are 11967-12284 levels. Asian stock markets spent most of Tuesday in negative territory, weighed by US and Euro debt concerns and the deadlock by US super-committee to approve the US$1.2trn deficit plan. 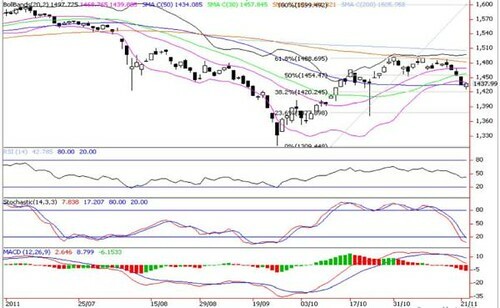 However, major indexes ended off their lows, led by rebounds in JCI (+1.5%), SET (+1.3%), SENSEX (+0.8%) and STI (+0.7%). The FBM KLCI also snapped its 5-day losing streaks with a 3.9 points gain, after falling as much as 11 points to 1425 intrday. We reiterate our view that investors should capitalize on rebounds to trim their positions or maintain a short-term trading oriented approach, given the start of year end school holidays and the concerns about contagion from the debt crisis in Europe. Meanwhile, the failure of the super-committee to reach a compromise on a debt-reduction plan exposes the U.S. sovereign rating to more downgrades as early as end December. psychological barrier. Immediate resistance levels are 1357, 1468 and 1481 (100-d SMA). The Dow Jones nosedived as much as 342 points intraday to 11454 before recovering to end -249 points at 11547. The sluggish performance was triggered after a Democratic aide said the super-committee is on the brink of failure. The Dow Jones is off 3.2% so far in Nov after a 9.5% gain in Oct and rallied as much as 18% to 12284 on 27 October from 3M low of 10404 points. After briefly surpassing the 200-d SMA (now at 11970) to as high as 12284 (27 Oct), the Dow corrected 6% to end at 11547 points yesterday, but still 11% higher from recent low of 10404. 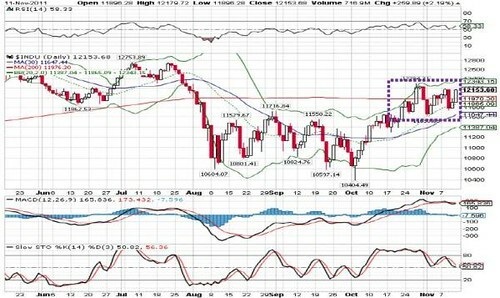 Following the breakdown of major supports of mid Bollinger band (11937 – which is also the 20-d SMA) and 100-d SMA (11660), the Dow may retest lower supports at 11344 (50% FR) and 11122 (61.8%) to form a temporary bottom. Further supports are the 11000 psychological level and 10847. Immediate resistance levels are 11970-12284 levels. Regional markets slumped owing to prolonged uncertainty over how euro zone leaders would respond to mounting funding difficulties for European banks, coupled with the deadlock by U.S. super-committee to approve the US$1.2 trn deficit plan. 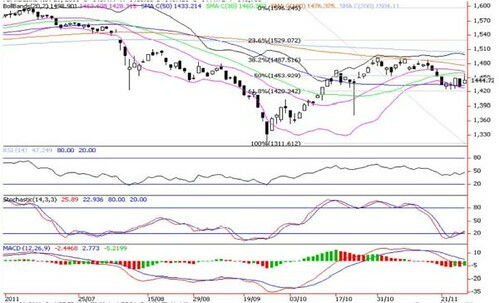 Sentiment was also dampened by the bearish remark and warning by Chinese Vice Premier that the global economy is heading towards a recession. KLCI lost 20 pts at 1434, led by PBBANK (-14 sen to RM12.54), TENAGA (-12 sen to RM5.53), MISC (-24 sen to RM6.45), GAM (-15 sen to RM3.11) and MAYBANK (-5 sen to RM8.25). We reiterate that more profit taking consolidation are expected this week, given the start of year end school holidays, the contagion debt crisis in Europe and the U.S. debt ceiling resolution on 23 November. FR) and the 1400 psychological barrier. 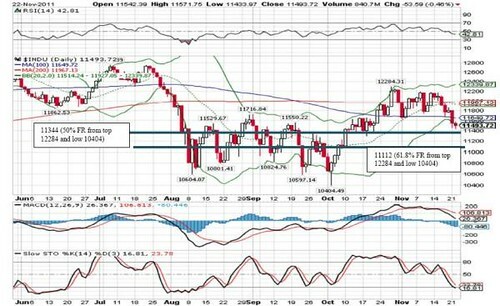 Immediate resistance levels are 1468 and 1483 (100-d SMA). After recoding a 2.2% gain last Friday, the Dow Jones closed down 74 points to 12079, off intraday low of 12027. The index was down as much as 126 points amid weakening euro and Italy’s borrowing costs which surged to 6.29% at an auction, deepening concerns that Europe will struggle to contain its debt crisis. Sentiment was also dampened by German Finance Minister’s comment that Europe’s permanent bailout fund may not be implemented before 2013 and German Chancellor’s party voted to offer euro states a way to leave the currency area, signaling a first step towards the foundation of a two-speed Europe—a region with and without the euro currency. # 1Q12/11 net profit of RM1,286.4m (+11.4% qoq; +25.1% yoy) was slightly above HLIB (26.7% of annualized full year forecast) and consensus (26.6%) forecasts. However, given guidance of higher credit charge ahead, we considered the results to be in line with HLIB and consensus. (under BII) and An Bihn Bank which recorded lower profits but contributions were insignificant. # Loans growth continued to be strong and ahead of 12% KPI with yoy domestic growth exceeding industry average. Deposits growth also strong and slightly ahead of 14% KPI. # Despite external headwinds, the group is confident about domestic demand and achieving its FY12/11 16% ROE KPI. # NIM pressure higher in Indonesia as magnitude of erosion in Malaysia reducing while Singapore is focusing on profitable loan segments. # Credit charge of 30bps more sustainable level over longer term vis-à-vis 15bps (annualized) in 1QFY12/11. # Asset quality ratios improved. Although there was increase in absolute IL (mainly from WOM Finance), overall asset quality is intact and maintainable. # Exposure to EU and UK is only RM2.2bn (0.4% of total assets) and mostly in AFS securities (with MTM loss of RM48m charged to reserves). # Comfortable with its capital ratios (which should support 12% annual growth) and proforma BASEL III core equity ratio of circa 8%, unless BNM sets a more stringent ratio. Unexpected jump in impaired loans, lower than expected loan growth and significant slowdown in capital market activities. Earnings growth from Indonesia while domestic operations also improving, new business divisions to better address competitive pressure and focus on customer centric. DRP provides downside protection. Have not entirely mitigated the dilution impact from debt raising and cash call. Target price unchanged at RM8.87 based on Gordon Growth with ROE of 15.1% and WACC of 10.2%. Tracking Dow Jones’ last Friday 2.2% surge, Asian markets closed on a bullish note, led by strong gains in TWSE (2.2%), KOSPI (2.1%) and HSI (1.9%) on hopes that new leaders in Italy and Greece will take decisive action to save their indebted nations from bankruptcy and pushing through reforms and austerity plans to restore their countries' tattered credibility. 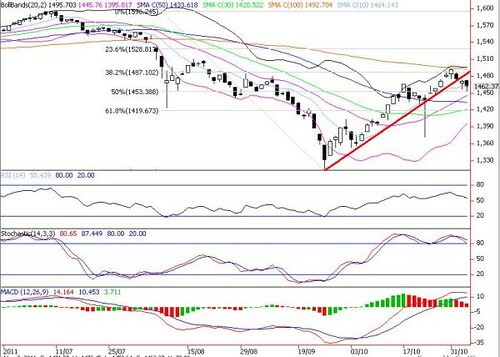 On the back of bullish regional markets, FBM KLCI jumped 10.1 points to 1478.9. Daily traded volume ballooned 38% to 2.85 billion shares, the highest since 8 February 10, as ACE Market and penny stocks surged due to strong retail participation. While economic numbers indicate that things are slowly getting better, fundamentals are being ridden by lack of direction in the euro zone. Given the headwinds in Europe, we have to learn to live with the volatility in the near term. Technically, daily trend and momentum indicators are weakening and are pointing to more consolidations. 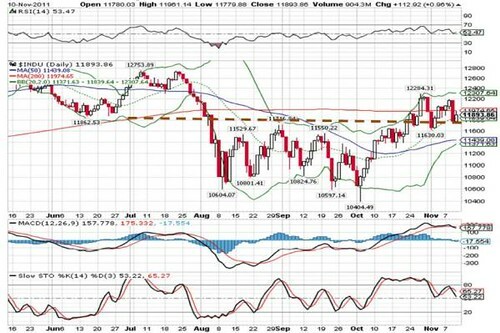 Immediate resistance levels remain at 100-d SMA (now at 1489) and 200-d SMA (1508). However, more positive readings on the weekly slow Stochastics and MACD should support further upside in the medium term. Thus, any downside consolidation will be well-supported by 1452 points (3 November intraday low) and 30-d SMA (1442 points). The Dow Jones surged 260 points last Friday to record a 1.4% weekly gain, after a better-than-expected Nov consumer report. Sentiment was also boosted as Italy and Greece moved closer to getting their financial crises under control. Italy's benchmark stock index leapt 3.7% and its borrowing costs plunged after the country's Senate passed a crucial austerity budget demanded by the European Union. The yield on Italy's benchmark two-year bond dropped 0.43% to 5.69% from as high as 7.13% last week. Tracking the mixed regional markets, FBM KLCI eased 3.9 points last Friday to 1468.8. WoW, KLCI declined 0.6%, its 2nd consecutive losses amid external woes that the contagion from the European sovereign debt crisis could spread from Greece to Italy, and possibly later to Spain (gross external debt/GDP of 153% in 2010). Average daily traded volume and value jumped 41% and 5% to 2.3 billion shares worth RM1.5 billion respectively, as ACE Market and penny stocks surged due to strong retail participation. Markets seem to be pleased in moving away from two big uncertainties, following the formation of interim Governments in Greece and Italy can start working on agreed austerity measures that could pacify investors and stabilize the financial markets. Moreover, the statement by Datuk Seri Najib Tun Razak on 11 November that the general election would not be held this year put an end to weeks of speculation. 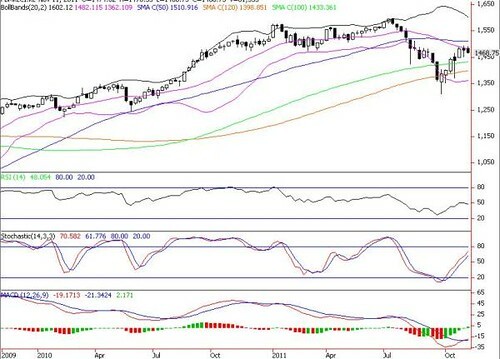 Technically, daily trend and momentum indicators are pointing to more consolidations as the KLCI fell below the 10-d SMA (now at 1477 points) and is unable to break the 100-d SMA (now at 1489) and 1500 psychological levels over the last two weeks. However, more positive readings on the weekly slow Stochastics and MACD should support further upside in the medium term. Thus, any downside consolidation will be mild and well-supported by recent November’s low of 1452 points and 30-d SMA (1439 points). After plunging 389 points on 9 November, Dow Jones rebounded 113 points to 11894, following better-than-expected jobless claims while a retreat in Italian bond yields and the selection of a new Greek premier tempered concern about Europe’s debt crisis. Italian government bonds rose after the ECB was said to purchase the securities and the nation sold the maximum amount of one-year bills on offer at an auction. Meanwhile, a statement from S&P affirming France’s rating and saying that a “technical error” was to blame for an earlier message suggesting a downgrade also lifted equities. 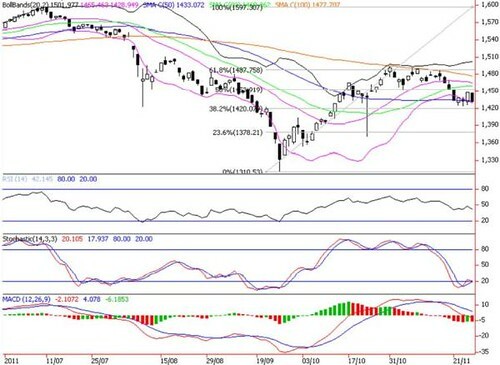 Dow Jones’ technical outlook also deteriorated lately following the massive plunge of 389-point on 9 November. 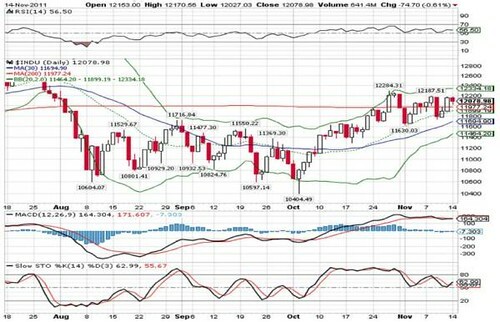 Immediate resistance levels are 200-d SMA (now at 11975) and upper Bollinger band (12308). For supports, it is crucial for the Dow to defend the neckline support near 11600. 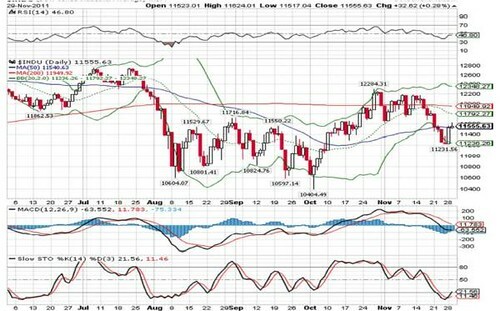 A breakdown below this level will trigger more selldown towards 50-d SMA (11439) and lower Bollinger band (11371). Asian markets tumbled amid concerns of China’s economic slowdown on slowing exports and soaring Italian bond yield that could trigger mounting debt crisis in Europe and eventually breaking up the Euro. Tracking the sluggish sentiment, FBM KLCI slid 16.99 points to 1472.7, due to the heavy losses by GENTING (-32 sen to RM10.68), IOICORP (-12 sen to RM5.05), CIMB (-10 sen to RM7.26), TENAGA (-13 sen to RM5.79) and AXIATA (-6 sen to RM4.90). We reiterate our view that in the wake of external wild swings driven by headlines, investors should SELL INTO RALLY or trim their positions. 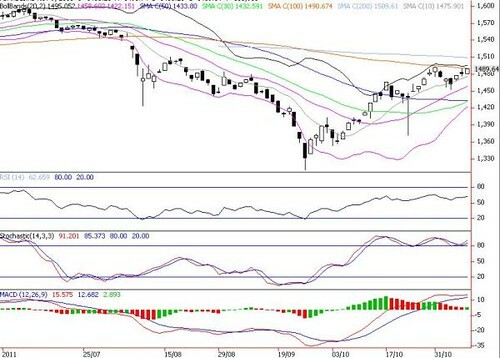 Technical outlook has weakened as KLCI was unable to break the stiff resistance zones at 100-d (now 1490) and 200-d (1509) SMAs, as well as falling below the immediate support of 10-d SMA (1477). 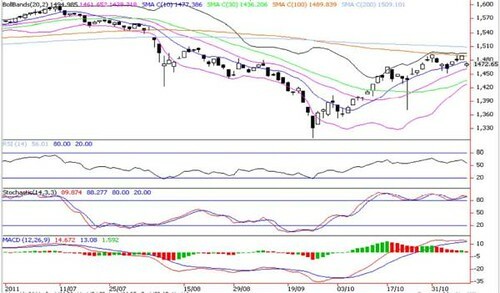 Further breakdowm below mid Bollinger band (1461) means that the current rally is likely to be disrupted, spurring more selldown towards 30-d SMA (1436) points. 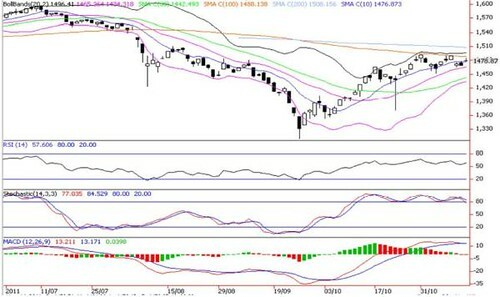 Daily KLCI: A Breakdown Below Mid Bollinger Band Will Drive KLCI Lower To 30-Days SMA. Tracking positive regional markets gains, the FBM KLCI jumped 9.2 points to 1489.6, driven by selected index-linked counters i.e. AXIATA (+13 sen to RM4.96), SIME (+12 sen to RM8.92), GENTING (+14 sen to RM11.00), PETCHEM (+7 sen to RM6.48) and CIMB (+4 sen to RM7.36). News of Italian Prime Minister Silvio Berlusconi's impending resignation lifted confidence that a new leader would act more effectively to tackle the country's debt woes. Trading volume and value soared 48% and 18% to 2.68 billion shares worth RM1.82 billion, focusing mainly on penny stocks and lower liners. In the wake of external wild swings driven by headlines, we reiterate our SELL INTO RALLY recommendation towards stiff resistance zones at 100-d (now at 1491) and 200-d (1510) SMAs. 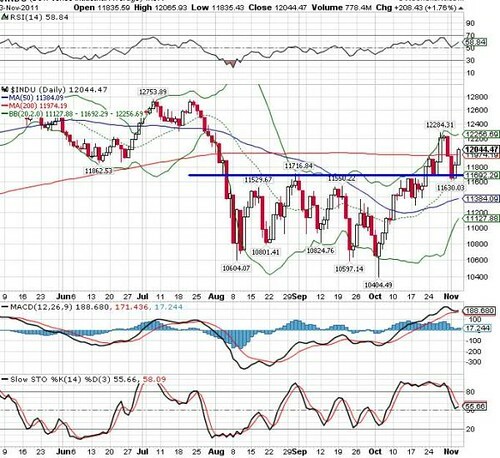 Immediate supports are 10-d SMA (1475) and mid Bollinger band (1458). 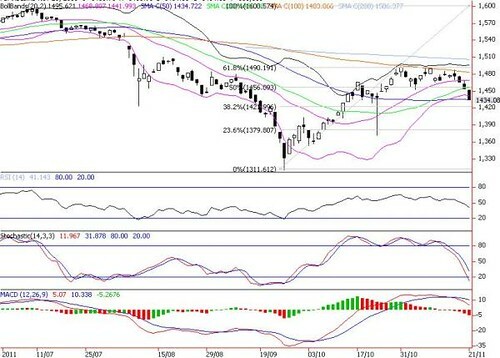 A breakdown below 1458 will mean that the current rally is likely to be disrupted, spurring more selldown towards 50-d SMA (1434) and lower Bollinger band (1422) points. # GenM’s US operations, Resorts World New York (RWNY) recorded a surprising net wins of US$651/VLT/day on its first day of business on 28th October 2011. # Its closest competitor, Empire City Casino (ECC) showed a 14% fall in its net wins, from US$310 to US$/VLT/day. For the remaining seven video gaming operators, their net wins movements vary within the range of ±6%. # On the following week, RWNY recorded an average net wins of US$629/VLT/day (-3% wow), while the net wins of other operators climbed back up. # The robust net wins/VLT/day implies significant potential upside, as it is 117% above our conservative assumption of US$300 per VLT per day. # We observed that despite some cannibalization, RWNY actually enlarged the overall market size as state wide’s net wins improved 23% after the inclusion of RWNY. 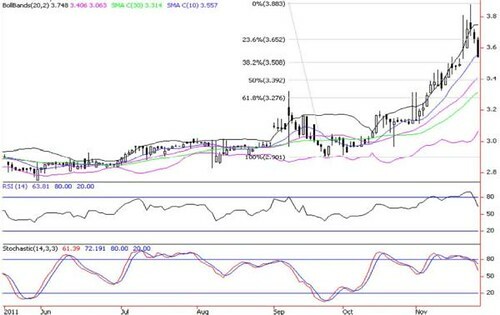 # We will continue to closely monitor RWNY’s net wins as the positive surprise might be due to novelty effect. We remained optimistic with RWNY’s performance given the potential upside from our conservative assumption. operation in Oct 2006. This underpins our view that RWNY has the potential of overtaking ECC as the market leader. # International operations to help boost GenM’s future earnings. # Better-than-expected performance from GenUK. # Approval of Florida’s destination resort legislation. 6) Destination resort legislation not approved by Florida Legislature. Unchanged, pending more data points on RWNY’s net wins. (3) New source of earnings from international markets to drive earnings growth. (2) earnings highly dependable on luck factor and hold percentage. Maintain BUY with target price of RM4.07 based on SOP. # Both IOI and DutaLand have agreed to revoke the sale and purchase agreement (SPA) to acquire 11,977.9ha of oil palm plantation land in Sabah for RM830m. # OSK Trustees Bhd (the stakeholder jointly appointed by both parties) will refund IOI both the deposit (RM83m, equivalent to 10% of the purchase price) together with the interest accrued. # Recall, IOI had on 28 Jul 11 proposed to acquire 11,977.9ha of oil palm plantation land (consisting of 5 estates that are planted with oil palm) in Labuk and Sugut, Sabah for RM830m. Subsequently, IOI has on 26 Oct 2011 issued a notice to Pertama Land & Development Sdn Bhd (a unit of DutaLand Bhd) to terminate the SPA due to “noncompliance of certain terms and conditions which had been communicated to Pertama Land”. None, as we did not reflect the potential interest income forgone from the potential loss of deposit (albeit immaterial, as this would only reduce IOI’s FY06/12 net profit by 0.1%). Also, we did not factor in the potential contribution from the this oil palm plantation land. Positive, as the dispute between IOI and DutaLand has now come to an end, and IOI will not lose the 10% deposit. (3) Recent developments may give rise to reputation risk. Perception to reputational risk (arising from the RSPO suspension) that would result in valuation multiple compression. SOP-derived Target Price maintained at RM4.57, and our Hold recommendation for IOI maintained. The Dow Jones jumped 209 points, near its intraday high as investors were encouraged by Greek Prime Minister's move to back down from a national referendum on the country's bailout package and lower weekly jobless claims, offsetting a slower October’s ISM service index. Sentiment was also boosted by the ECB’s surprised 25bps cut in its benchmark interest rate to 1.25% to revive stalling growth as the euro zone could see "slow growth heading towards a mild recession" by end 2011. Sentiment has turned slightly better following Dow Jones' resilience to defend above the neckline support near 11600 as a breakdown below this head & shoulder support will trigger more selldown towards lower Bollinger band of 11128 and 11k psychological level. 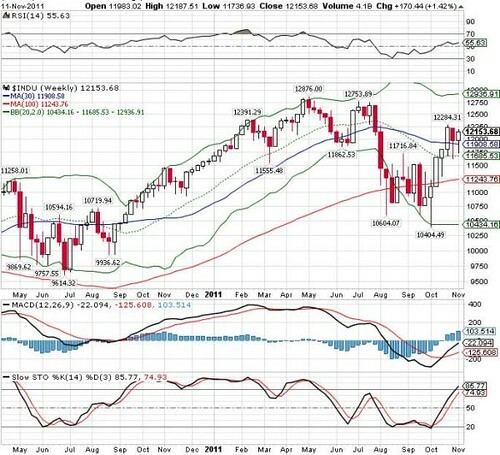 Nevertheless, given the increasingly overbought technical readings, the Dow Jones could face stiff resistance near 12500 and upper Bollinger band (12567). Asian markets fell as chaos over Greece's role in the euro zone battered investors’ sentiment. Fallout from Greece’s bailout scheme could lead to a disorderly default, affecting European banks that could ripple across the global financial system. FBM KLCI also lost 8.6 points to 1462.4, its 3rd consecutive loss and lowest close since October 25. Turnover rose 12% to 1.76bn shares but total value tumbled 33% to RM1.14bn given the focus mainly on lower liners and penny stocks. Market breadth was bearish with 524 losers and 226 gainers. The local bourse showed some resilience over the last two trading days as it managed to mitigate huge intraday losses to close moderately lower on selective blue chips bargain hunting towards closing. week’s high) and 1500 psychological levels.